Grilled vegetables are a great addition to your summer meal. Easy to tend and even easier to clean up. 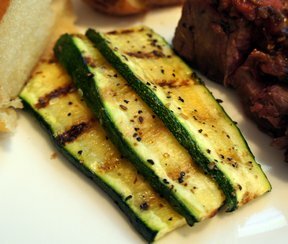 Your garden zucchini takes on a whole new flavor when it spends a little time on those hot grill grates. Trim ends of zucchini, slice each about 1/4" thick, either into coins or the length of the zucchini. Mix butter, olive oil, and lemon juice together. Lay out zucchini slices and brush with butter mixture, sprinkle with garlic powder. Grill over medium-high heat for about 2 minutes on each side or until golden brown. Salt and pepper. Serve warm.